The advantages of distributed intelligence for hydraulic drive technology are leveraged by Bosch Rexroth through the integration of axis controller functions (IAC integrated axis controller). Our high-response valves with integrated digital axis controller actively control the axes independently of the machine control by using separate motion functionality and process the data of various sensors that can be connected directly. The compact modules are based on proven proportional and high-response valves and offer a wide variety of axis controller functions in addition to easy integration in the control concept. IAC-Multi-Ethernet axis controllers have position, pressure, and alternating control capability. The IAC-Multi-Ethernet platform allows machine manufacturers to freely choose from among key Ethernet protocols such as sercos, EtherCAT, Ethernet IP, PROFINET RT and Varan. This, in turn, makes it possible for designers to establish a flexible connection to the higher-level control systems of many different manufacturers. The integrated axis controller facilitates the direct connection of a wide variety of sensors via simple and proven M12 connection technology. In line with our best-in-class motion control concept, the three most important performance requirements are to ensure a open, scalable and easy-to-use design. IAC-R axis controllers have position, pressure, and alternating control capability and NC functionality for position control. Analog sensors for pressure, a position measurement system with 1 Vss, or an SSI interface can be connected. IAC-R axis controllers are available as PROFIBUS/CAN BUS valves and additionally with clock-synchronized PROFIBUS DP/V2 technology (PROFIdrive profile). 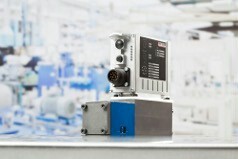 The Motion Control solution for applications with Siemens CNC Sinumerik 840 D(i) sl: IAC-R PROFIdrive. The high-response valve with integrated digital axis controller and clock-synchronized PROFIBUS DP/V2 is a single-axis controller optimized specifically for use under the Siemens control SINUMERIK 840D(i) sl. IAC-P axis controllers offer the possibility of closed-loop pQ and pressure control and, through differential pressure measurement, a real closed-loop flow control, which is independent of loads or system pressure. The valve characteristic curve required for this is saved in the form of a table in the on-board electronics. Up to 3 miniature pressure sensors can be integrated directly in the valve.